PERRY COMO-I THINK OF YOU, IN NASHVILLE, JUST OUT OF REACH AND TODAY. Nowadays, there’s been a resurgence in Easy Listening music. Just like many other musical genres, it’s fallen in and out fashion. However, nowadays, a new generation of music lovers are discovering the music of crooners. This includes everyone from Frank Sinatra to Nat King Cole and Tony Bennett through to Andy Williams, Matt Monro and Jack Jones. That is not forgetting Perry Como. Just the other crooners, Perry Como went on to inspired several generations of modern musicians during a career that spanned sixty-five years. During his long and illustrious career, Perry Como was a prolific and versatile artist. He enjoyed widespread commercial success during the forty-four years he was signed to RCA Victor. Perry Como signed to RCA Victor in 1943, and in 1987 released Today which was his last album for the label. Today is one of four albums on a two CD set that was recently released by BGO Records. It features I Think Of You, In Nashville, Just Out Of Reach and Today. These albums were released between 1971 and 1987, and show different sides to Perry Como. The first of this quartet of albums was I Think Of You. As 1971 dawned, Perry Como was about to record his twentieth album for RCA Victor. This was I Think Of You, an album cover versions of pop and soft rock that had been released over the past year. Among the eleven songs that were chosen for I Think Of You, were ones that originally been recorded by Bread, Glen Campbell, Lobo, Ocean, Simon and Garfunkel and The Carpenters. This included Roland Kent LaVoie’s Me and You and a Dog Named Boo; David Gates’ If; Cindy Walker’s Dream Baby (How Long Must I Dream), Gene MacLellan’s Put Your Hand In The Hand and Paul Simon’s Bridge Over Troubled Water. They were joined by other songs that were tailor made for Perry Como’s mellow baritone. Among them, were Canache Armando Manzanero and Gene Lees’ and Yesterday I Heard the Rain; Francis Lai and Carl Sigman’s (Where Do I Begin?) Love Story; Francis Lai and Rod McKuen’s I Think Of You; Alex Harvey’s Someone Who Cares and Eddie Snyder and Richard Ahlert’s My Days of Loving You. The final song was For All We Know, which had been penned by Fred Karlin, Arthur James and Robb Wilson of Bread. Just like other songs on I Think Of You, it would recorded at RCA Victor’s Studio A, in New York. Arranging and producing I Think Of You was Don Costa, who had worked with crooners Frank Sinatra and Tony Bennet and discovered Paul Anka. Accompanying Perry Como on nine of the eleven tracks, were The Ray Charles’ singers. The recording sessions began on January 14th and were completed on April 30th 1971. After that, Perry Como’s twentieth album was ready for release. Before that, critics noted that the songs on I Think Of You were perfect for Perry Como. The veteran balladeer made them his own, and left his own indelible stamp on songs like If, Baby (How Long Must I Dream), Yesterday I Heard the Rain and (Where Do I Begin?) Love Story. These songs brought out the best in Perry Como. Record buyers agreed. When I Think Of You was released as a single, it reached fifty-three in the US Billboard charts, but topped the US Adult Contemporary charts. Across the Atlantic, I Think Of You reached number fourteen. Buoyed by the success of the single, I Think Of You sold reasonably well upon its release. Perry Como was still, one of the most popular American crooners. He was also a versatile singer. Four years later, in 1975, and Perry Como was en route to the Nashville, to record a country album, In Nashville. RCA Victor had had booked a session with producer Chet Atkins. At RCA’s Nashville Sound Studios, Chet Atkins had brought onboard a crack band that featured some of the city’s top session players. They were joined by Anita Kerr Quartet, who added backing vocals on the twelve tracks that Perry Como was due to record. Among them, were Willie Nelson’s Funny How Time Slips Away and My Own Peculiar Way; John D. Loudermilk’s That Ain’t All and Cindy Walker’s Gringo’s Guitar. When the album was completed, Perry Como was in for a surprise. Rather than release In Nashville on the main RCA Victor, the album was released on their Starcall label. It was essentially, a label that specialised on releasing albums that were heavily advertised on the television. While this was meant to make In Nashville was available to a wide audience, it was a missed opportunity. Releasing an album on Starcall hadn’t the same kudos as releasing the album on the main RCA Victor label. Some artists felt it devalued the product. What Perry Como’s thoughts were are unknown. However, it must have been a disappointment. Especially considering how Perry Como seemed embrace country music so successfully. Especially on songs like Funny How Time Slips Away, Here Comes My Baby, I Really Don’t Want To Know, Stand Beside Me and My Own Peculiar Way. Perry Como sounded as if he had lived and survived some of the lyrics. Other times, his vocal veers between needy to full of hurt and heartbreak. He hadn’t however, turned his back on his trademark sound and incorporated this into several songs. The result was a very underrated album from Perry Como. It’s addition on BGO Records’ two CD set is welcome one. So is the addition of Just Out Reach. In Nashville wasn’t the only album that Perry Como recorded in Nashville with Chet Atkins. Later in 1975, Perry Como returned to record what would become Just Out Reach. For Just Out Of Reach, ten tracks had been chosen. This included Tony Hatch and Jackie Trent’s Let’s Do It Again; John D. Loudermilk’s Then You Can Tell Me Goodbye and Lennon and McCartney’s Here, There And Everywhere. Two Ben Peters songs, Let It Be Love and Love Put A Song In My Heart were chosen. That was no surprise, as he was a successful songwriter. Among the other tracks were Gloria Shayne’s The Grass Keeps Right On Growin’; Virgil F. Stewart’s Just Out Of Reach; Bob Duncan and Peter Jordan’s Let Me Call You Baby Tonight; Kris Kristofferson’s Loving Her Was Easier (Than Anything I’ll Ever Do Again) and James Stein’s Love Put A Song In My Heart. These songs were recorded at RCA Victor Studios, in Nashville during 1975. Recording of Just Out Of Reach took place throughout 1975. The sessions began on January 7th at RCA Victor Studios. Again, producer Chet Atkins had brought onboard a crack band that featured some of the city’s top session players. The rhythm section featured drummers Buddy Harman, Kenny Malone and Larrie Londin; bassists Henry Strzelecki and Mike Leech and rhythm guitarists Bobby Thompson, John Christopher and Paul Yandell. They were joined by guitarists Grady Martin, Pete Wade and Reggie Young and pianists David Briggs and Randy Goodrum. Beegie Cruser played electric piano and The Nashville Sounds adding harmonies. With such a talented band accompanying him the album was soon completed by 15th October 1975. RCA Victor wanted to release Just Out Of Reach before 1975 became 1976. That wasn’t going to be easy. Critics had to have their say, and then the album had to be promoted. Somehow, RCA Victor managed to get Just Out Of Reach released just before the end of 1975. By then, critics had had their say on Just Out Of Reach. 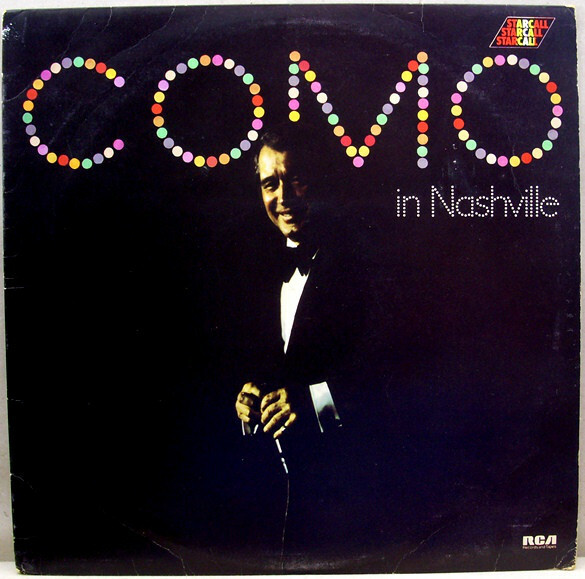 It was hailed as one of the finest albums Perry Como had recorded in Nashville. Especially ballads like Then You Can Tell Me Goodbye, Let It Be Love and Just Out Of Reach. They play to Perry Como’s strengths, as he breathes life, meaning and emotion into the songs. Then on Let Me Call You Baby Tonight, Loving Her Was Easier (Than Anything I’ll Ever Do Again), Make Love To Life and Love Put A Song In My Heart The Nashville Sounds prove the perfect foil for Perry Como. The result was an album of country, easy listening and pop that again, found favour with his loyal fans. 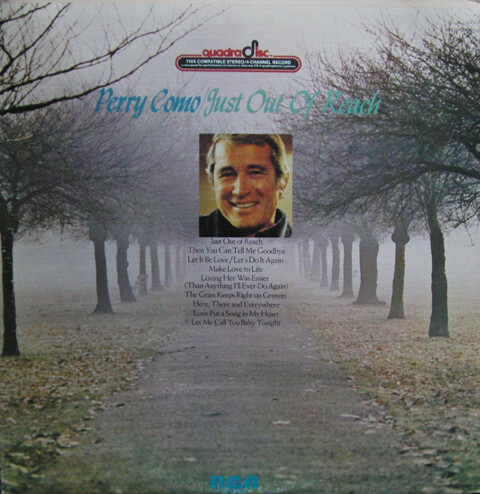 However, the next album on the BGO Records’ two CD set is Perry Como’s 1987 swan-song for RCA, Today. Forty-four years after first signing to RCA Victor, Perry Como was about to record what would be his swan-song for the label, Today. It was the twenty-ninth album Perry Como had recorded for RCA Victor. He had also decided that Today would be the last secular studio album of his career. Perry Como was going out at the top, with his reputation in tact. So great care went in to choosing the right material for Today. Eventually, ten tracks were chosen, including some familiar songs. This included Burt Bacharach and Carole Bayer Sager’s That’s What Friends Are For; Michael Masser and Gerry Goffin’s Tonight I Celebrate My Love For You and Larry Henley and Jeff Silbar’s Wind Beneath My Wings. Two Roger and Hart compositions, My Heart Stood Still and You’re Nearer were chosen. They were joined by Jerry Herman’s The Best of Times and Sammy Cahn’s Making Love To You. The other three songs featured music by producer Nick Perito. This included Dee Williams’ Sing Along With Me; L. Russell Brown and Irwin Levin’s I’m Dreaming of Hawaii and Richard B. Matheson’s Do You Remember Me. These three tracks, and the rest of Today were recorded at Evergreen Studios, Burbank, in California. Recording of Today began on 2nd of February 1987. By then, Perry Como was ready to record the songs. He had practised the songs on his boat, singing along to a copy of the master tape. This meany that when Perry Como entered the studio, he was ready to lay down his vocals with producer Nick Perito. This he did against lushly orchestrated arrangements. By the 3rd of February 1987, Today was completed. Perry Como was now about to release his final secular studio album. Before Today was released, critics had their say on his final secular studio album. It was a polished and accomplished album, where Perry Como put his fifty-four years experience to good use on ballads and uptempo tracks. Many of the cover versions Perry Como gave a new twist. However, just like so many of his previous albums, Perry Como shawn on the ballads. With the lushest of strings for company, he came into his own on Making Love To You, The Wind Beneath My Wings, You’re Nearer and My Heart Stood Still. One of Today’s highlights is Perry Como rework of Tonight I Celebrate My Love For You. Later, on Today he delivers a wonderfully wistful version of Do You Remember Me. Then he signs of in style with The Best Of Times, which seems fitting as it was Perry Como’s RCA Victor swan-song. When Today was released later in 1987, it was his first album to be released on both CD and LP. The album sold reasonably well, and Perry Como bowed out at the top, with his reputation in tact. Unlike many of his contemporaries, Perry Como didn’t make a comeback. He was seventy-five when recorded Today. It was the last studio album of secular material he released. 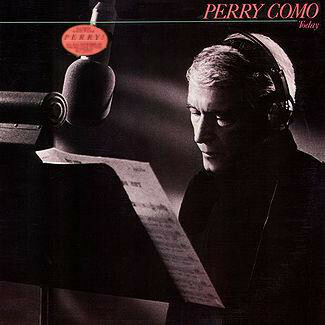 The only other album Perry Como recorded, was an album of Christmas songs in 1994. By then, Perry Como was eighty-two. However, that was the only time Perry Como ever stepped foot in a recording career. He was content to enjoy his retirement, after a long, illustrious and successful forty-three year recording career. That was spent at just one label, RCA Victor. 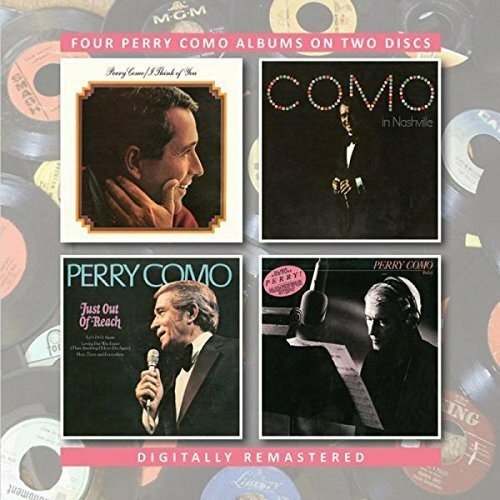 Four of the twenty-nine studio albums Perry Como recorded for RCA Victor feature on the two CD set that was recently released by BGO Records. It features I Think Of You, In Nashville, Just Out Of Reach and Today. These albums were released between 1971 and 1987, and show different sides to Perry Como. Seamlessly, Perry Como flits between easy listening and pop, to country on In Nashville and Just Out Of Reach. Still Perry Como’s trademark style is present on these two country albums, as he lives the lyrics. That is sometimes the case on I Think Of You and Today. Other times, Perry Como reinvents the songs, taking them in new direction. Having done so, he leaves his own indelible mark on familiar songs. They take on new life and meaning, in the hands of one of the greatest crooners in musical history, the late great, Perry Como. ← RECORDARE: THE SONGS OF ENNIO MORRICONE.